Unlimited FREE Energy Right Inside Our Pockets?! When we talk about sources of unlimited free energy we usually think of Nikola Tesla. Well thanks to the brilliant mind of Tesla this time the scientists managed to convert the radio waves into free energy by using a small type of gadget. What you see on the picture may look like an unremarkable slice of electronics, but it can theoretically power a low-energy device forever, and for free. If that sounds like a big deal, well… that’s because it is. Drayson, research and development company which has a particular interest in energy, developed the first commercial technology that literally creates electricity out of thin air. We’re constantly surrounded by an ever-denser cloud of RF signals. They’re the reason your smartphone gets 2G, 3G and 4G coverage, your laptop gets WiFi, and your TV receives digital broadcasts. Capturing this unlimited free energy could be our key to creating more sustainable society (and hopefully evolving from type 0.7 civilization to type 1). Furthermore, research into the field has never really left the lab, though a company called Nikola Labs is hoping to release an iPhone case that’s said to extend battery life using RF energy harvesting. According to Drayson, Freevolt is the first commercially available technology that powers devices using ambient RF energy, no dedicated transmitter required. The key to Freevolt is said to be the efficiency of its three constituent parts. A multi-band antenna scavenges RF energy from any source within the 0.5-5GHz range, which is then fed through an “ultra-efficient” rectifier that turns this energy into DC electricity. A power management module boosts, stores and outputs this electricity in form of a constant unlimited free energy — and that’s all there is to it. The company thinks Freevolt can be the backbone of the connected home, and in a broader sense, the internet of things. Sensor-based devices, such as a smart smoke alarm, can be powered by Freevolt indefinitely. 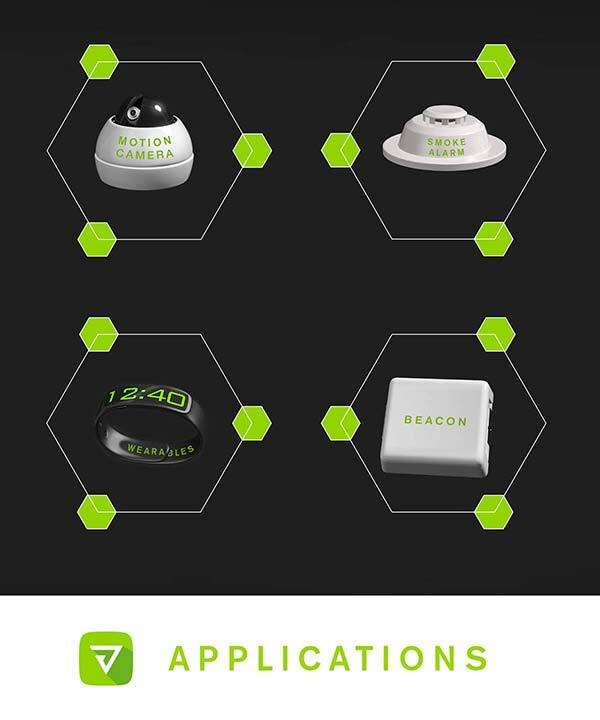 Beacons that provide indoor mapping and targeted advertising are also perfect candidates. While it’s easy to visualize specific examples — a smoke alarm that never needs a new battery, or a low-power security camera that isn’t bound to a mains outlet — the true potential of Freevolt is hard to grasp. An entire smart city — where roads know when they’re busy and bins know when they’re full — could be devised using countless sensors that require no upkeep, and have no overheads beyond the price of the hardware itself. We’re talking about unlimited free energy here: devices that never need charging, cost nothing to run, and aren’t limited by the location of an external power source. It’s a powerful idea, and beyond sensors, Drayson imagines Freevolt being used to trickle-charge all kinds of hardware, significantly extending the battery life of a wearable, for instance. Drayson is currently working on miniaturizing its initial reference design and creating a flexible version that can be integrated into clothing, among other things. It might take some time before Freevolt finds its way into products, as Drayson is relying primarily on other companies to dream up and develop real-world applications. That said, Drayson has created a consumer product of its very own that’s powered solely by Freevolt: an air pollution monitor called CleanSpace. CleanSpace is a continuous carbon monoxide monitor that sends data back to your smartphone via Bluetooth. From the companion app, you can see real-time air pollution levels, and review your exposure during that day, recent weeks and further. The app also keep tabs on your travels, encouraging you to build up “CleanMiles” by walking and cycling rather than taking motorized transport. These banked CleanMiles can then be exchanged for rewards provided by partners such as Amazon, incentivizing you to travel in non-polluting ways.